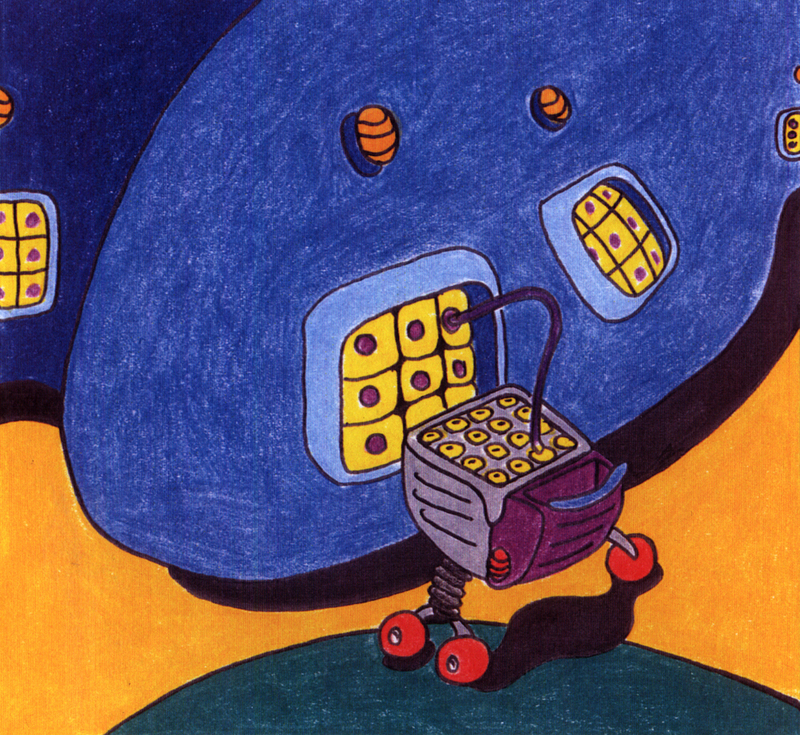 New ideas for packaging, storage and transport in supermarkets, food retail outlets and the home. 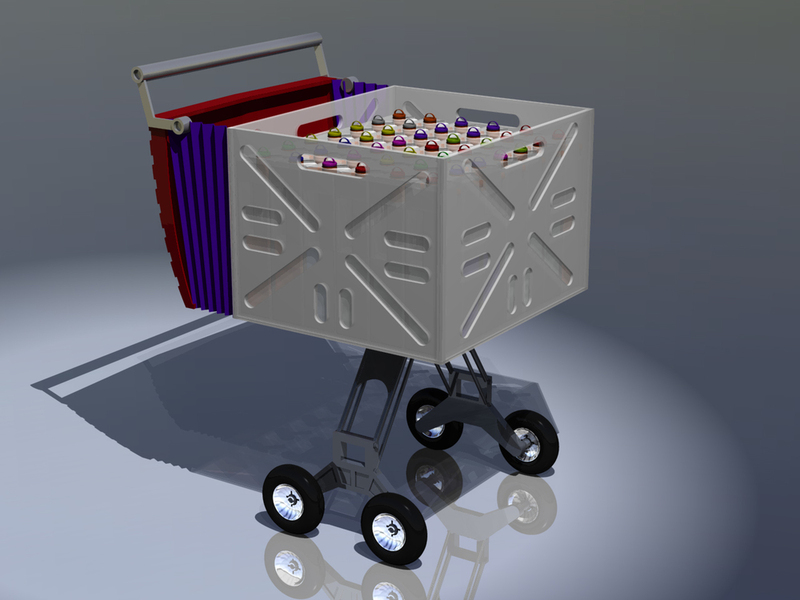 The Smart Kart is a modular food transport and storage system for shoppers. The Smart Kart concept has been developed as a convenient alternative to supermarket packaging that would dovetail into the emerging use of smart and expert systems in food handling, storage and measuring and minimise handling. 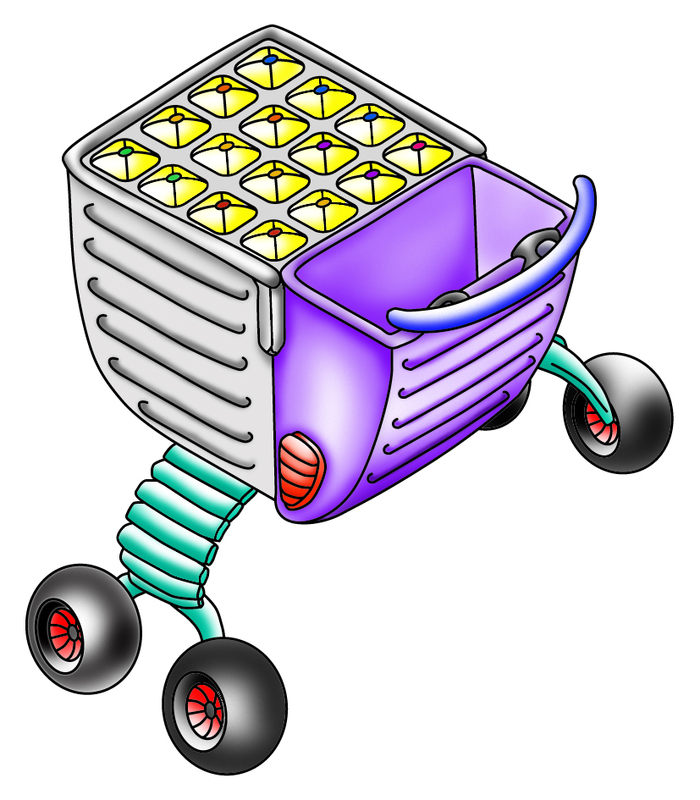 The cart is composed of 4 elements. At its core is a milk crate sized stackable plastic bin filled with a matrix of removable, interlocking containers, like large Lego blocks, with colour coded lids. The shopper can take as many of these as is required to the supermarket and can purchase additional ones. Dry and wet bulk food produce is purchased from large hygienically sealed dispensing units at the supermarket or store. Like petrol pumps, a flow meter calculates the value of the goods bought and down loads the appropriate debit onto your credit card or a bar-coded chit for payment on exit. Product advertising once carried by the product packaging is replaced by banks of video monitors covering the dispensing machines. The product videos, updated daily via the Internet, display the latest prices, improvements and tips for use. Information on product use, legals and offers can be downloaded to print form, transferred to a customer flash card or smart card or sent to a customer’s internet address or mobile phone. Colour coded lids on the trolley containers differentiate the various categories of use for the different containers. For purchase of only a few bulk items the customer might take a few of the containers in a conventional carry basket. The containers, each about 1.5 litres in size, fit as a matrix into the square plastic bin – the main body of the trolley. Once home, the container matrix can be pulled apart and stored in different parts of the kitchen depending on the requirements of the food or products purchased. The containers can also be evacuated for long-life storage. Different dispensing tops can be fitted to the containers for the most convenient form of food delivery at home. Different sized trolleys are available for different sized user groups. Empty containers are sterilized and cleaned at the supermarket to ensure a uniform, high level of hygiene. The bin attaches to the trolley’s folding undercarriage. This undercarriage can be stored in the customer’s car, when not in use. The trolley can be used for the entire journey from supermarket to home with the least amount of additional packing and unpacking. Finally a conventional-style shopping basket, integrated with a pusher handle and accessories pouch, is clipped to the main trolley body. This shopping basket can also be used on its own. This project is based on the GM ‘Shopper’ concept car prototype. Project collaborators: Professor Chris Ryan, RMIT Centre for Design.